After a somewhat prolonged delay at the quayside waiting for the toxic gas used fumigate the contents of the container to disperse, the vessel with our container on board is now on the high seas. We have had to pay an extra charge to cover the costs of the extra time sitting on the quay but at least it is now moving and the latest expected arrival date is the 2ndof December. This is taking much longer than initial estimates so I assume there may be issues with weather conditions, either that or the ship going the long way round. We are using a Tanzanian firm called Teddy Junior & Co to clear the container through customs they have been very helpful and have alerted us to the fact that the regulations have recently been changed and we are now required to give more details about the contents of the load. This is something we feel that MA Logistics who were handling the transport to Dar es Salaam should have been able to advise us about. Apparently it is no longer sufficient to state that a box is filled with books, you must also indicate how many books are in each box. Since we only discovered this after the container was packed we were unable to give all of that information. We have given as much additional information as we have and hope there will not be a problem with customs in Dar es Salaam. We have also asked our donors to give us letters declaring that the goods were all given freely and these have been faxed to Teddy Junior & Co. It is hoped that the fact that these documents show that the goods were all gifted and that they are educational, will help to avoid paying tax at the port. Ntimba and Baraka have finalised the arrangements for getting the container down from Dar es Salaam to Namanditi and will travel to Dar nearer the time to supervise the transport of the container on its final stage. Fundraising is beginning again and Alice’s daughters Louise and Cheryl held a pampered chef party last month. 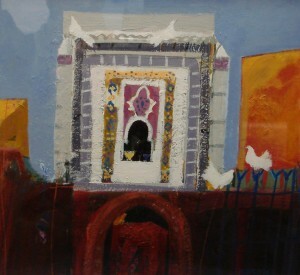 We plan to have a sale of jewellery and scarves soon and there is a raffle on the go, where only 100 tickets will be sold at £10 each and the prize will be the painting , Marrakesh Niche, donated by contemporary Scottish artist Christine Woodhouse. The money raised will be used to buy sports equipment for the school. So far 40 tickets have been sold and it is hoped that the remaining 60 will also sell over the next couple of weeks. Shortly before Christmas the plan is to ask Santa Claus to pick the winning ticket and the photograph of him holding the lucky ticket will be posted here. 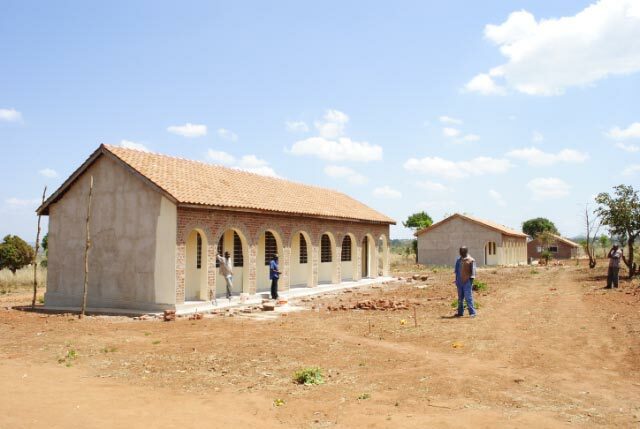 The work on completing the classrooms is progressing well, the roofs are complete with ridge tiles and the walls have been painted cream. 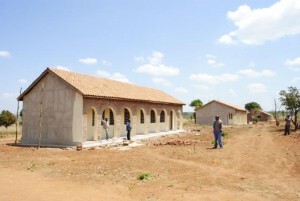 The toilet block is also nearing completion and bamboo has been sourced to build the fence. 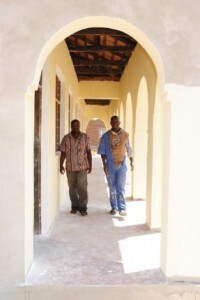 It is expected that brickmaking for phase two will be started soon before the rains. The interior and exterior walls have been painted a rich cream colour and the school really looks good. There are still things to be done but we are on target for the opening at the beginning of January. We are very close to having sponsors for all 20 of the children we met in the summer from the outlying villages and should know for sure within a few weeks. At that point the children will be told that they are being sponsored and will be able to attend the new school when it opens in January. This opportunity will be one of the best Christmas presents they will ever receive. My name is George Schilling and I am a Peace Corps Volunteer working in Morogoro. I came across your article on google beacuse I was looking for some idea on how to get my large shipments of about 2000 books through the customs office. The shipping costs are paid for and the only thing that is holding them up is that we want to make sure that there will be no problems in the customs office. I was hoping you could give me some advice on what you did and how to make the process as smooth as possible. I plan on contacting Teddy Junior & Co soon, but I thought I might ask for your help first. If you could, please contact me at my email address. Thank you very much and hongera sana on such a job well done!